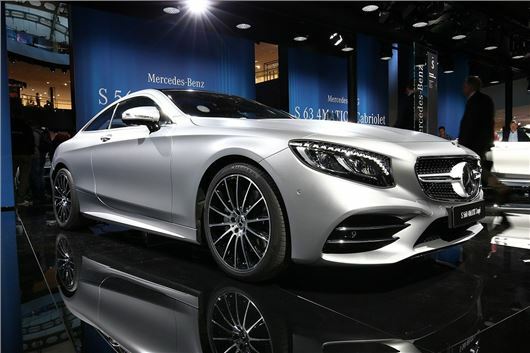 The updated Mercedes-Benz S-Class Coupe and Cabriolet have been revealed at the 2017 Frankfurt Motor Show. Updated engines and new technology are the key improvements to the new models, which are due on sale in early 2018 and will be priced from more than £100,000. The old 4.7-litre V8 from the S 500 is gone and has been replaced by the S 560, which uses a 4.0-litre twin-turbo V8 with 469PS. This has 700Nm of torque and can get from 0-62mph in 4.6 seconds if you go for the all-wheel drive, 4Matic Coupe. AMG versions are also available. The S 63 AMG uses the same engines as the S 560, but with peak power turned up to 612PS and peak torque of 900Nm. And if you really want to show off, there’s an S 65 AMG with a 6.0-litre V12, 630PS and 1000Nm of torque. Inside, there is a new steering wheel design with touch-sensitive controls, plus there is a new 12.3-inch dual display, as seen in the updated S-Class saloon. There are also subtle changes to the exterior, with new tail lights and a new grille design.